On Sunday 3rd March we entered the Burton Competitive Vocal Festival for the first time. We all enjoyed the new experience. We were up against some very impressive competition and although we were not placed we obtained a "Comended" grade with a score of 84. This is wonderful given our members are not subjected to an audition unlike most of the other entrants and certainly the placed groups. This is a great tribute to our MD Simon Lesley. We do other things than sing! 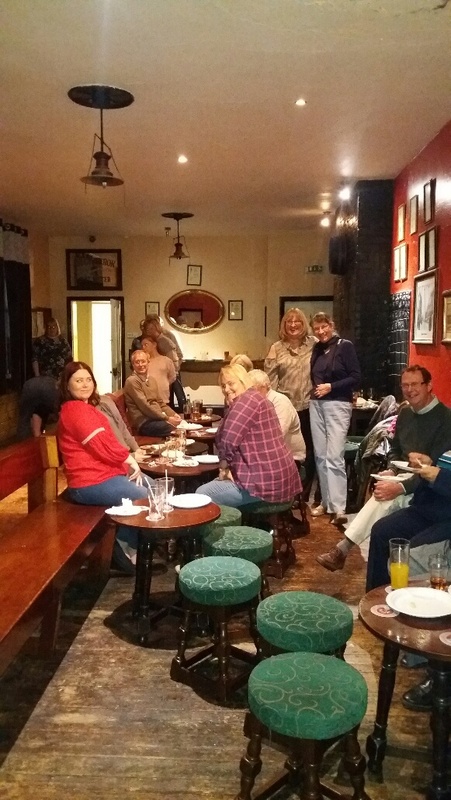 On Saturday 6 May a number of us spent a highly amusing and enjoyable evening upstairs at The Burton Bridge attempting to knock down all the skittles. We comprised 7 groups of four. After the first round Diane Millar, the organiser, started to rachet up the fun. We didn't just bowl with our dominant arm but then with the other one. Some teams actually got a higher score this way! We then had to face the wrong way and bowl through our legs. I found that worked quite well!. The next ordeal was to bowl through the splayed legs of the rest of our team. After a few pints, making sure we did not smash their ankles was a challenge. Fortunately no 999 calls were necessary. A few highlights were captured on Margaret's 'phone and they are displayed here. The runaway winners were Glyn, Christian and cousins from Poland. For further pictures see the Gallery section. 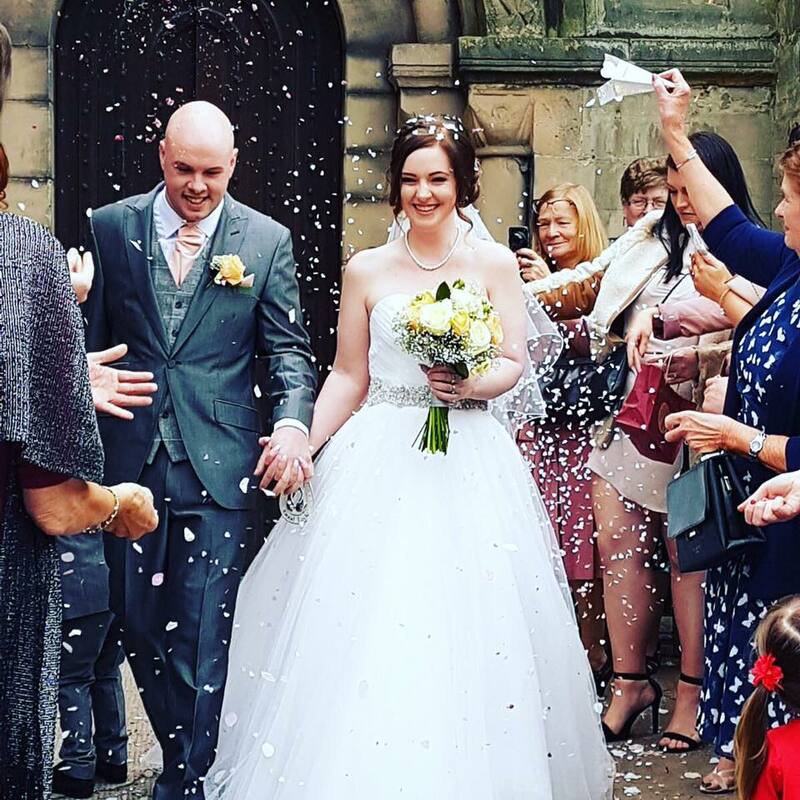 On Friday 21st April a group of us had the pleasure of singing at Lucy and Ryan's wedding. Lucy is the daughter of long-standing member and former secretary, Inger Brendstuen. First we sang the well-known opening hymn "Jerusalem". Later while the bride and groom were signing the register, we sang John Rutter's now popular "This is the Day". This was composed especially for the wedding of Prince William and Kate Middleton back in 2011. Our final contribution was "Lord of all Hopefulness". After the wedding a group of us enjoyed a good lunch at the "Spread". Were were invited to provide the entertainment at the 2017 team captain's inauguration. On Saturday 11 March we assembled in front of the clubhouse and sang: "Like a Bridge over Troubled Water", "All you need is Love" and, ladies only, "Wherever You Are". It was an interesting experience singing outdoors! We all enjoyed the buffet afterwards. At our rehearsal on 13 April 2016 we celebrated our founder member, June Wedd's 90th Birthday. Our chairman, Jo Ballington, presented June with a bouquet and June made a delightful speech. Being a choir we sang "Happy Birthday" with great joy and gusto. Afterwards, we continued the celebrations downstairs in the bar at "The Spread". June cut her cake, ably made by Carol Kobylanski and we all enjoyed sharing it with June..
June has and is a very active member of the Rolleston Choral Society having sung in over 100 concerts. She served on the committee in many roles over the 52 years of her membership. She is a delightful person and we trust she will be singing with us for many years to come. "HAPPY BIRTHDAY". Our concert titled "Animal music from the deep" was both a sell out and a great musical success. John Phillips has written a detailed and witty review about this latet concert (see Concert Review section). If you performed in or came to the concert you will recognise much of what John has written. For those who did not attend, hopefully this review will inspire you to either join our choir or attend the next concert. Once again Rolleston Choral Society has entered St Mary's Advent Festival. Now in its tenth year, the theme is "A literary Christmas". 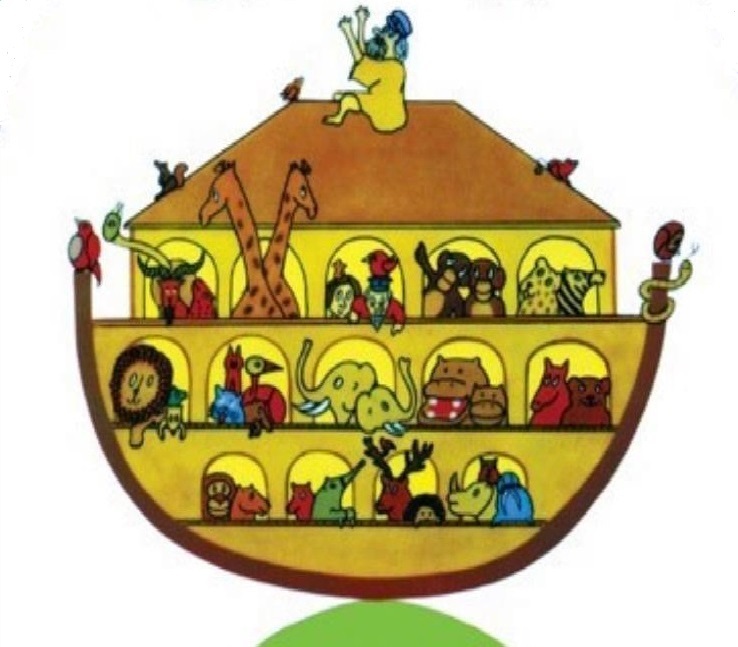 We have adopted "The Messiah" as our interpretation of this theme. 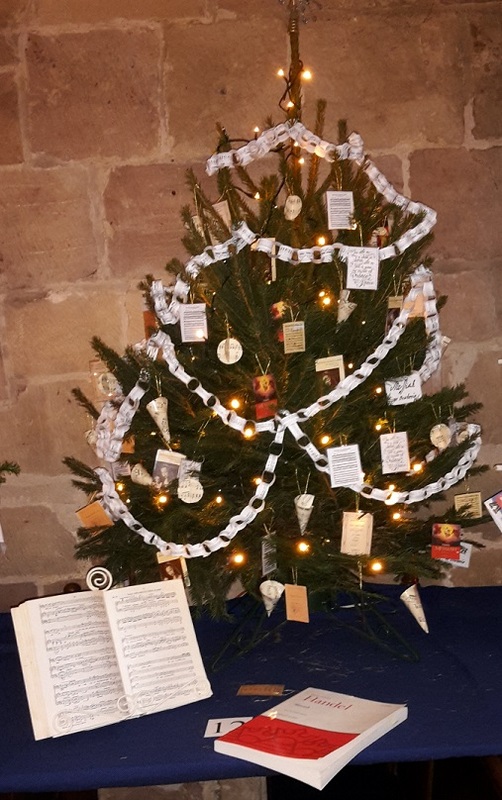 The RCS tree has been most ably inspired and decorated by members: Cherry Burston and Inger Brendstuen. We hope the photograph inspires you to pop down to the church and have a real viewing. There are 40 other entries from village organisations and individuals. Cherry Burston also has an original entry based upon Hercule Poirot's Christmas. Admission is by way of a suggested donation of £2. The festival is open daily from 1:00pm to 6:00pm., commencing today Friday 27 November and ending Monday 30th November 2015. 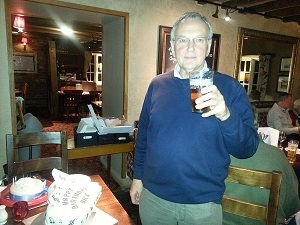 After the rehearsal on Wednesday 21st October we held a surprise 70th birthday party for Nick Waller, our long-standing accompanist. Click on "Read More" for his thank you email to the choir. Go to the Gallery section for more photos. Simon Lesley returned in September to take over the reins once again after his sabbatical. We started straight in rehearsing for our autumn concert to be held on 17 October at St John's Church, Horninglow, Burton on Trent. We will be performing Haydn's wellknown Nelson Mass and a recently discovered Requiem by 19th Century composer Robert Pearsall. A further delight will be a performance of Mozart's Kegelstatt Trio by Rev Michael Freeman, Rebecca Lesley and Karen Thompson. 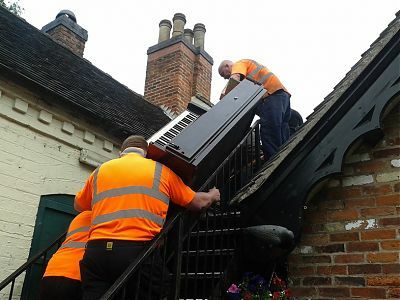 On 18 August 2015 we moved the piano from the Methodist Chapel to The Spread Eagle. This mighty effort was arranged by our accompanist Nick Waller who enlisted Andy Holden and his team to undertake the task. Nick Waller, Ken Ballington and Paul Taylor from the choir assisted in the process. Initially the piano was carried out of the chapel and onto the back of a flat bed truck which was then driven to the Spread. After much deliberation on the best route to take, it was decided to use the outside fire-escape leading to the upstairs corridor. We had to remove both the fire-escape door and the door to the rehearsal room in order to squeeze it through. The accompanying photograph shows it halfway up the fire-escape. After a few minor repairs and a retune, it is now back in use for our rehearsals. This has freed up the electric piano for split rehearsals in the neighbouring Church. Somehow we doubt if the piano will ever leave the Spread! After performing The Crucifixion by Sir John Stainer we started moving into our new home at The Spread Eagle in Rolleston. 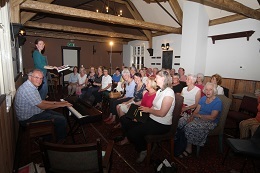 The landlord, Keith Spalton, has been very accommodating and we are not only able to rehearse in the upstairs meeting room but we are also able to store our collection of music in one of the old bedrooms. The first rehearsal was held on 15 April. This was for our summer concert titled "Curtain Up". Of course, the new venue makes it very easy for those of us who like a pint after our Wednesday evening rehearsals - we just go downstairs! Last year we were given notice that the Methodist Chapel would be closing and we would no longer be able to use it for our rehearsals. On 11 March we had our final rehearsal there. 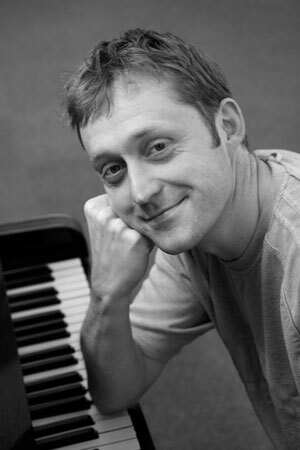 Towards the end of 2014 our Musical Director, Simon Lesley, asked if he could take a sabbatical until the autumn of 2015. This was agreed and we invited Jane Phinn to take over for our Spring and Summer concerts. Very fortunately she agreed. We started the year with a concert titled “1914 and All That”. As the title suggests, we performed a wide variety of music popular around 100 years ago. 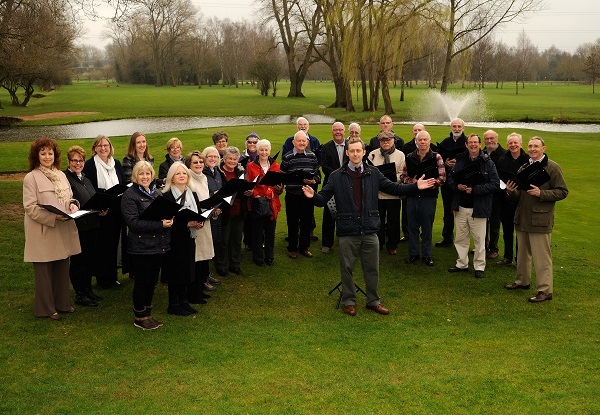 We staged this concert as part of the “Love Rolleston” weekend. Our major celebration concert for our 50th anniversary year was a performance of Karl Jenkins’ acclaimed work “The Armed Man”. Burton Town Hall was packed and we, along with the Staffordshire Band received a rapturous response. 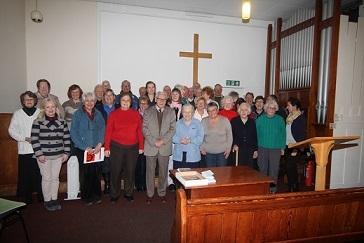 We rounded off the year with a lovely Christmas concert in St Mary’s, Rolleston. We were ably supported by the children of John of Rolleston School. Site design by Kieran Harrod.